These markers have a, ¼” wide tip (6mm), 3/4” wide tip (17mm), 2" wide tip (50mm). High Opacity. Marks on most surfaces, including glass, metal, wood and plastic. Marker Pen especially for fluorescent writing board - Water-based, dry-wipe prescription. - Easy to wipe off with wiper, tissue paper - High Brightness neon color, Best for indication on mirror, plastic board, Light board, or glass under black light (ultra-violet) or fluorescent lamp etc. - Water-base without toxic, No harmful to skin. - To activate-shake well with cap on and upright remove cap and press tip to surface several times until tip fills with ink, do not over pump, recap tightly after use and store horizontally. High Opacity, Waterbased,pigmented ink. Marks on most surfaces, including glass, metal, wood and plastic. Also suitable for marking paper, plastic, mirrors, wood and stone. Great for advertisements on glass. Marker stay on board until you wash them off with glass cleaner, even outside. Works with most dry erase vinyl. If you are looking for a new and exciting way to add a bit of color to your signs, look no further! 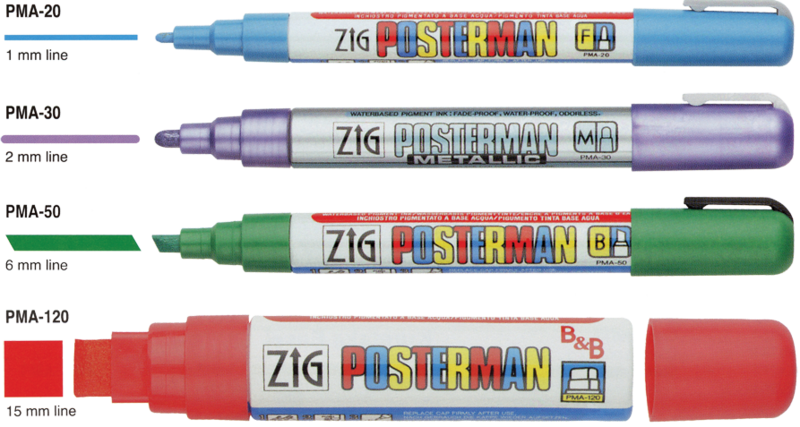 We have a wide range of markers perfect for use on any non-porous surfaces, especially glass and chalk boards. The range of markers are available in all the colors of the rainbow to make your sign the center of attention! These markers are available in different tip sizes, allowing you to create eye catching designs with as much detail as you need. All designs can be easily removed with either water or the quick and easy ZIG Chalkboard Cleaner dependent upon the type of ink used.